The following is a short guide to send WhatsApp messages with different text formatting: bold, italics, and strikethroughs. 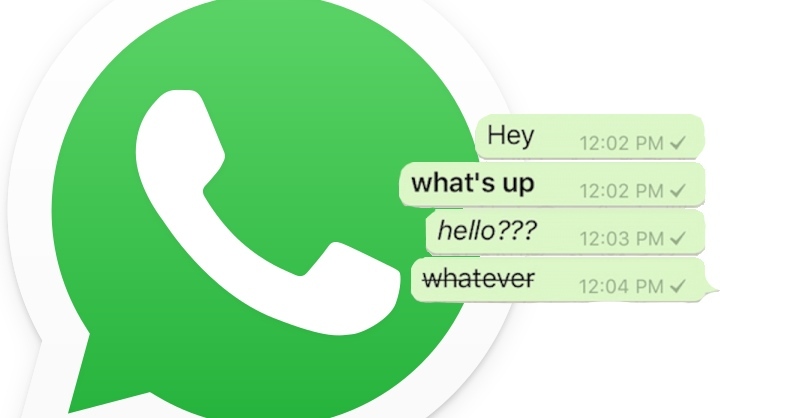 WhatsApp’s developers have rolled out a new feature that allows you to make your text bold, italics, and strikethrough. The text formatting options work on iOS, Android and Windows phones that have installed any WhatsApp version from v2.12.535 and above. If you haven’t updated the app yet, follow this procedure to do it within a couple of minutes. Text formatting is only available for the mobile versions, and not yet supported on the web. To format text using the “Italics”, simply insert an underscore either side of the word or phrase. Example: writing _WhatsAppLab_ the result will be: WhatsAppLab. If you want your text to be bold, simply insert an asterisk * either side of the word or phrase. Example: writing *WhatsAppLab* the result will be: WhatsAppLab. Finally, to make your message strikethrough, just insert a tilde ~ either side of the word or phrase. Example: writing ~WhatsAppLab~ the result will be: WhatsAppLab. Do you want to format text using both Bold and Italic in the same word or phrase? Nothing could be simpler. To do this simply insert both the asterisk and the underscore symbols on either side of the word or phrase you want to send. Example: writing _ *WhatsAppLab*_ the result will be: WhatsAppLab.